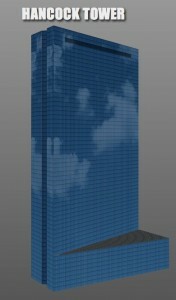 Still feeling inspired by Building a CSS City, I recreated another Boston building using CSS transforms this weekend: the Hancock Tower. This one was a bit tougher than building the Prudential Tower because it is more than just a few different size boxes stacked on top of each other. Creating the main body of the building wasn’t too hard, except for the inset parts on the thin sides. The base, on the other hand, was a pretty big pain. Fitting the sides together and sizing a top was a bit of a struggle (and probably mostly unnecessary because no one really notices that part of the building), but I think it turned out pretty well. The roof of the base flickers when spinning around the back of the building in Chrome for some reason, but appears perfectly in Safari. After getting the building shape together I added the glass window texture and the darker row on the top of the building. Also, I think the coolest part of the Hancock Tower is how it reflects whatever is around it, so I added a cloud photo that rotates as the building moves around. Take a look at the Hancock Tower demo in a webkit browser (Safari looks better than Chrome if you have the option). Last week I saw an awesome post by Matteo Spinelli on Building a CSS City and loved the idea. 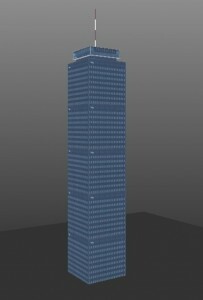 Since I am somewhat obsessed with trying to build things with 3D transforms (even though they are very impractical at this point), I decided to attempt the Prudential Center. The concept was basically the same as his, except instead of building out I am building up. The tower is built of 4 blocks stacked on top of each other: the spire, hub, neck and floors. Each block is essentially a cube of a certain size positioned using CSS Transforms and skinned with a texture. The proportions of the building are not quite right, but I couldn’t find them anywhere easily enough. The other sections use similar transforms, just with different sizes and offsets to align them in the center. Take a look at the Final Demo in any webkit browser. 1) I was using ‘class’ as an element in the options object and threw an error in Safari. 2) The rest of the page besides the gallery looked really uninteresting. 3) A ring is the only shape that we could make. Luckily, since then I have fixed all of those things plus added a couple more improvements. Obviously it is nice that this will work for people with Safari and the page is not as terrible looking, but the most interesting part is the new shapes. This weekend I was creating a couple fun ideas with Zoomooz.js, an awesome jQuery plugin for zooming to elements on a page, and was bummed to see that it couldn’t handle 3D transforms yet. After seeing Paul Hayes 3D Sphere and the Morphing Power Cubes, I spent a bunch of time playing around with 3D CSS transforms without coming up with anything too practical. But, after some of my Zoomooz experiments, I thought it would be interesting to see if it would be possible to create a scalable 3D slideshow in the model of the Morphing Power Cubes’ ring setup. Unfortunately this only works in webkit browsers because that is the only one that has 3D transform support as of this moment, so I am using Modernizr to test if your browser can preform the 3D Transforms.